Scroll past the 2013 Mazda CX-9 review video below to start reading about the new CX-9. We take our mission to outfit the best reviews transcribed by Mazda automotive writers - it's just another thing that makes us the leading Mazda franchise in Houston. As you read this article, you'll see that it is jammed with invaluable information on all of the things you'r looking for in the new CX-9. Get started by reading the full review or watching the video. Check out the 2013 Mazda CX-9 alongside versus similar autos like the 2013 Dodge Durango, Ford Edge and the Chevy Traverse, and you will find that the 2013 CX-9 outshines those vehicles in gobs areas. View the reasons see why! 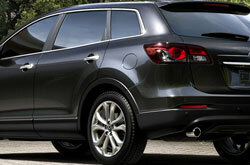 See inside the 2013 Mazda CX-9 - view video here! Joe Myers Mazda's car repair men and women have served Houston for years with phenomenal workmanship and trustworthy Mazda parts. If you avoid repairing your CX-9, its physical shape could wilt, so drive it to Joe Myers Mazda's service center in Houston. For customary oil changes and other Mazda services like front and rear brake pad maintenances and wiper blade replacement, come to us. We even work on big duties with without breaking a sweat, including jobs like shock and strut repair. What's more, you can always expect cheap service at our Mazda auto repair center in Houston. Take a look at our current service specials by clicking the link below.